The Rottweiler is a wonderful family dog that loves an active lifestyle and protecting their homes and people. The Rottweiler is a very old breed that originated with the Romans and were used to herd their cattle and protect their homes. 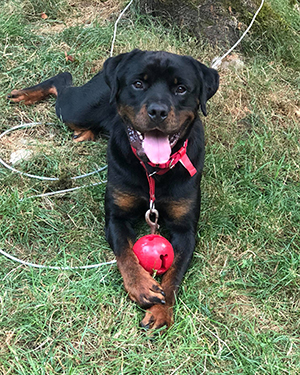 The breed we know today was further developed in and around the town of Rottweil, Germany, and was once known as the Rottweiler Metzgerhund—the butcher’s dog. 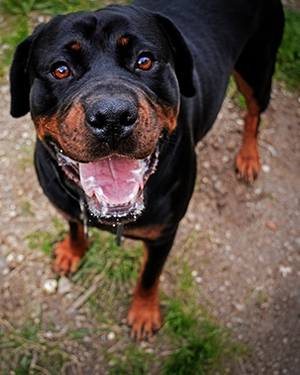 Rottweilers are intelligent, confident dogs, with personalities ranging from affectionate, people-loving charmers to reserved, discriminating, “strong silent type” personalities. They are generally quiet dogs—barking only when there’s a reason to bark—and deeply devoted to their humans and home. They are at their best, and happiest, when included as a member of the family. Experienced Rottweiler owners, or at least experience with working dogs and their need for exercise and having a “job” to do. Fenced yards (minimum 6 feet tall). Active owners who love to take their dog wherever they go. Owners committed to training and socializing their dog. Homes with no fence or fencing shorter than 6 feet. Homes where the dog will be left alone all day/night, or apartment dwellers who cannot commit to exercising the dog on a daily basis. Owners who desire to, or must keep the dog outside (Rottweilers are INDOOR dogs). “Heavy handed” or overly coddling/protective owners who will not/cannot properly train and socialize the dog. People who are not willing to train the dog, especially families with active young children, or who raise livestock/small animals and allow these animals (and the dog) free run of the property. 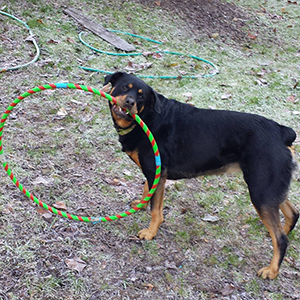 Rottweilers MUST be well-trained to be accepting of these high-stimulation behaviors and situations. Off-leash dog parks are generally not recommended. Rottweilers tend to be very physical in their play style, and may also want to herd the other dogs, both of which can lead to disagreements. Training is a must with this breed. They are cute as puppies but soon grow to be large and difficult to handle without training. Some people are afraid of Rottweilers. Females: 22-25” at the shoulders, and approximately 80-90 pounds in weight. Males: 24-27” at the shoulders, and approximately 100-120 pounds in weight. Rottweilers are black with tan to rust or mahogany markings. The darker markings are more desirable. Any base color other than black constitutes a disqualification and should be avoided. 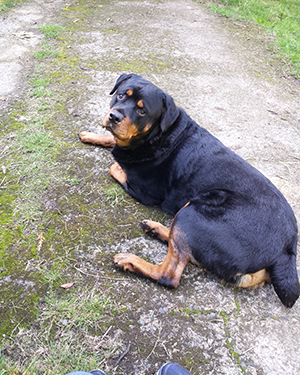 Indoors, the Rottweiler is a “couch potato.” Outdoors, their activity level is moderate. They require sufficient amounts of exercise to maintain adequate mental and physical condition. These are working dogs and need to work—even if it’s only a walk. About 10 years, on average. Cancer of all types is what usually takes the life of these dogs. In general, Rottweilers are wonderful family dogs. They enjoy the activity of children and will protect their homes and people. 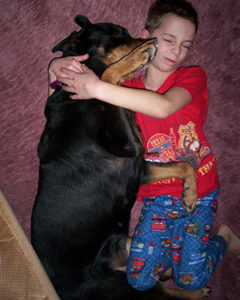 Very young children can be injured just due to the size and weight of the Rottweiler. I do not recommend adopting to a family with children under age 6. When introduced properly, Rottweilers get along well with other animals, including small breed dogs and household cats, and they can also be excellent farm dogs. They are good around small livestock like chickens and ducks, and, as a natural herder, can be trained to help when the stock needs to be rounded up for the night. Squirrels, however, are always fun to chase. 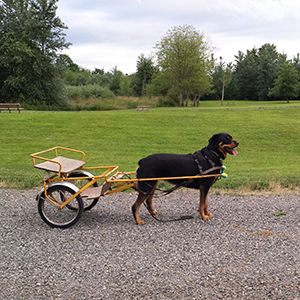 Rottweilers are a working breed and love to work with their owners on any task. Rottweilers can, and do, excel at just about anything their owners are willing to do with them as long as the activity and the training are fun and non-punitive (Rottweilers respond best to positive reinforcement training methods). Such activities include obedience, agility, herding, lure coursing, tracking, carting, and therapy work. Although the Rottweiler has a short coat, they have a thick undercoat that requires brushing to keep the fur balls from taking over your house. Brushing their teeth, cleaning their ears, and trimming their nails are also necessary tasks. Health concerns can include: bloat/torsion, cancers, cardiomyopathy, cataracts, elbow and hip dysplasia, and hypothyroidism.